She was actually living somewhere else during the time of the offences – which ran for two periods between November 2009 and September 2010 – and sub-letting the first property. This is the second time the 33-year-old has committed such an offence. Akhtar, of Blackwall Way, was handed 100 hours of unpaid work and ordered to pay £250 costs after being found guilty of dishonestly claiming jobseeker’s allowance, housing benefit and council tax benefit during a case at Thames Magistrates’ Court in July 2010. The housing benefit falsely claimed totalled £1,085 the council tax benefit £29. The independent councillor won her seat in the May 2010 elections, where she originally stood as a Labour candidate but later defected to become an independent to work alongside mayor Lutfur Rahman. She submitted a doctor’s letter saying she was unwell and therefore unfit to stand trial but the first judge threw it out and threatened to issue a warrant for her arrest if she did not turn up by the afternoon. She is due to be sentenced on February 6. Akhtar, who also for some reason spells her name Aktar, works at Tower Hamlets College as a part-time “Youth and Enrichment Worker” for 20 hours a week, according to her register of interests. The background to her arrest can be traced through this link here. I fully expect Mayor Lutfur Rahman to issue a strongly worded statement condemning her and saying that she should stand down as a councillor. We’d then have a very interesting by-election. I’ve just had a look at the time-sheets Akhtar (pictured next to the Mayor at last year’s anti-EDL march) has submitted to the council for her work as an upstanding representative of the people. They’re here. She claims to work between 53 and 90 hours a month. Ahem. But what’s really interesting is that despite news of her arrest in November 2010 (at which time we also learned of her previous conviction for benefit fraud), she continued to attend “group meetings” and “mayoral engagements”. She was expelled from Labour in October 2010, so the only “group meetings” she can refer to are those of the Lutfur Rahman independents. Although they’re not classified as a group, they do meet for “group” discussions on a regular basis. Last month, she spent two hours at group meetings and six hours on mayoral engagements; in November it was two and five hours respectively; in October, it was four and eight. In total, since December 2010, she has attended 34.5 hours of group meetings and 38 hours of mayoral engagements. Assuming her claims are true (yes, yes, that is a big assumption), it seems she has been an integral part of Lutfur’s inner circle since she was arrested. That would be an incredible misjudgment by Lutfur, if true. The rot continues. I fully ‘expect’ the odious Rahman to do as you say, Ted. Although I will believe it when it happens. Is the rumour (on the thread you linked to) that she is Rahman’s cousin true? A shocking betrayal of the people she represents. She needs to go NOW. There are no excuses this time – she committed benefit fraud while she was a Cllr. She must stand down. on January 9, 2012 at 7:10 pm You couldn't make it up! Representing the electorate is an honour. Surely only honourable people should be allowed to stand and be elected as councillors? The FACT (as reported) that she has been convicted of her SECOND offence of benefits fraud caused my jaw to drop. It also leads me to think that some very serious questions need to be asked about the processes used in Tower Hamlets to present candidates to the electorate. If you deny an offence and are convicted on the evidence does that make you a liar? Is that good enough for the electorate within her constituency? What sort of an example does that set? If you’re elected despite failing to mention that you’ve previously been convicted for benefits fraud what does that make you? If you’re selected as a candidate without adequate checks revealing convictions what does that say about a political party and the candidate? If Cllr Akhtar, as indicated above, has been previously convicted of an offence which she’d have to declare in any application for a job at Tower Hamlets surely she should also have had to declare it to the party that originally sponsored her and/or declare it to the Electorate at the election? Otherwise isn’t it at the very least misrepresentation? Isn’t that a dishonourable thing to do? Others might choose to call it something different……..
Mayoral engagements surely result from a mayoral request. Did LR ask SA to undertake these duties? If so, what were they? Having twice defrauded Tower Hamlets of Housing benefit and CTB can we really take Cllr Shelina Akhtar’s time sheets at face value? How are these documents checked? Are further details that can be verified independently supplied to the Council? As a twice convicted fraudster she must be stripped of any responsibilities and excluded from the Independents “Group Meetings” immediately. Why do we have to wait until she is sentenced (which could be months away) to kick her off the Council? Suspend her expenses now and only pay them if she gets less than the three months which would automatically end her incumbency. The East London Advertiser has made a small error. It’s not Electoral Commission rules which say that a councillor is disqualified by a prison sentence of three months or more; it’s statute law: Local Government Act 1972, s. 80 (1) (d). “a person shall be disqualified for being elected or being a member of a local authority if he .. has within five years before the day of election or since his election been convicted in the United Kingdom, the Channel Islands or the Isle of Man of any offence and has had passed on him a sentence of imprisonment (whether suspended or not) for a period of not less than three months without the option of a fine”. Presumably if the Judge sends her to prison for three months (or more) the seat will become vacant by law – but is this automatic or is it ‘expected’ that she resigns? The judge sounds like he is warning her to expect a custodial sentence. If the sentence is “suspended” does that still count? I too have heard the persistent rumour that she is a relative of Lutfur Rahman. Ted – would Lutfur answer this question if he was asked, formally? I wonder who is on the Labour short list to stand in the by-election should it happen. I doubt Abdul Alim will be the LP candidate again having lost last time mainly because of the perception he had been foisted upon local members. I hope this time they at least consult the local party members to see who they’d like to have representing them. Ghulam Mortuza is the new chair of Spitalfields ward party so maybe he will put himself forward and the merry-go-round can continue unabated, unless he is barred from standing -is he? Personally, I would support Mosabbir Ali as an example of a very hard working, demonstrably loyal and well liked local activist… but getting selected by THLP seems to me to be rather like dating because neither women nor THLP ever seem to go for the nice guys…. She’s lucky – the government has said it intends to make sub-letting of council flats a criminal offence but I don’t believe the legislation is in place yet otherwise she would also be sentenced for that. As it is she has potentially withheld the availability of a council flat from somebody (possibly one of the long, long list of her constituents) who is in genuine need of housing. James – the disqualification of a councillor given a sentence of over three months is automatic, but note that it takes effect only after the end of all appeals. Even if a councillor choses not to appeal then they are not disqualified until the end of the time allowed to submit one. As you’ll see from the Act quoted, it applies to suspended sentences just the same. on January 15, 2012 at 11:39 am You couldn't make it up! The judicial process does not prevent the Council from investigating this Councillor and determining what is appropriate action. Nothing that the Council does right now will change the verdict of the jury. It’s also very interesting to note that the Leveson Inquiry is investigating what has been going on within newspapers at the same time as the Police are conducting a criminal investigation into alleged wrongdoing. It’s perfectly possible for two investigations to run in tandem so long as the “inquiry” process respects the territory of the superior legal process. An interesting question to ask would be whether this deception and fraud is isolated – or whether other Councillors have also done or are doing the same thing…..
We already know that former Tower Hamlets Councillor Baroness Pola Uddin was in error in claiming a very considerable sum in expenses for a home she did not occupy – and was suspended from the House of Lords for 18 months as a result. 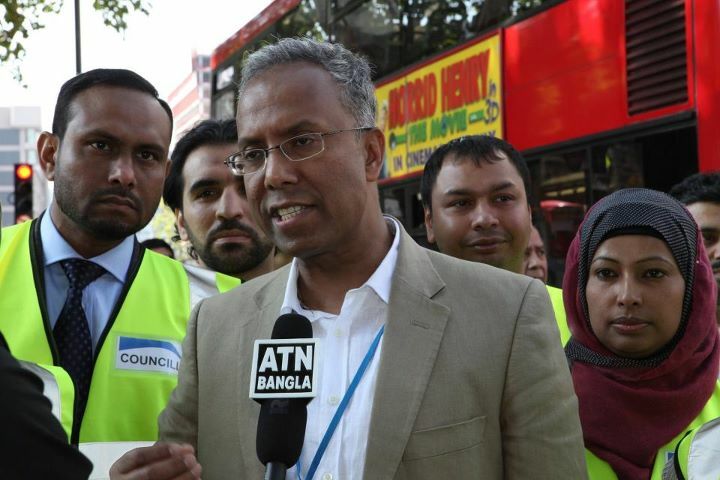 Are these two isolated incidents – or are they part of a wider pattern of misguided and/or fraudulent behaviour by councillors in Tower Hamlets? These are people holding public office and the issue is the use of public money – it’s therefore clearly in the public interest for us to know what the real situation is. I cannot emphasise enough that the most important action the Council and the Mayor can take is to broadcast loud and long that this sort of fraudulent behaviour will not be tolerated at any time and to be seen to be taking clear action to reinforce this point. Or do we need to wait for the government to take action to criminalise the sub-letting of homes funded by public money for this message to be finally grasped?